Pumla has served as a Chartered Accountant for some of South Africa’s largest and best-known firms, including her previous role as Head of Finance and Executive Associate to the CFO at Discovery Health, and Accountant at RMB. She also spent four months working and living in Lagos, Nigeria, while on secondment to the KPMG Nigeria office. Pumla is a Fund Manager at Visio Capital Management. 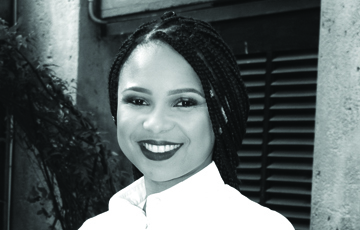 She has completed several post-graduate qualifications, including the Captains of Industry Management Programme at Henley Business School, a Board Leadership course at Duke University, and a postgraduate Emerging Markets and Country Risk Analysis summer study course at Fordham University in New York, USA. She is known for her dedication and energy, as well as being a hard-working and results-oriented person who works equally well on her own and in a team. Pumla serves on the AWCA Board. Previously she served on the SAICA Members in Business Forum and Corporate Reporting User’s Forum. She is a member of the Investment Analyst Society and the Association of Black Securities and Investment Professionals. As a member of the AWCA, Pumla has been extensively involved in the AWCA Bursary Committee and AWCA Power Teas Mentorship Programme. She is also a founding member of “Uplift as we climb”,an annual project that facilitates charity drives in Diepsloot and mentors youngsters in her personal capacity.